No more three-for-one deals, but BOGO is alive and well on Jos. A. Bank’s homepage. Men’s Wearhouse is about a year and a half into its ownership of Jos. A. Bank, and it’s safe to say things aren’t going so well: after layoffs in March 2015, and ending three-for-one suit deals, sales are down, way down. But Men’s Wearhouse says it’s got a plan to turn things around, and isn’t giving up on the suit-slingers at Jos. A. Bank just yet. Men’s Wearhouse executives said on a Thursday morning conference call reported by MarketWatch that they didn’t realize how “toxic” some of Jos. A Bank’s promotions would be before they decided to buy the company for $1.8 billion in November 2014. It seemed like a good challenge, said Chief Executive Doug Ewert, as Men’s Wearhouse had a history of taking on struggling brands and turning them around. The company saw an opportunity to grab a nice chunk of the market, and it went for it. But customers didn’t react well when the retailer ended the three-for-one suit deal, with Jos. A. 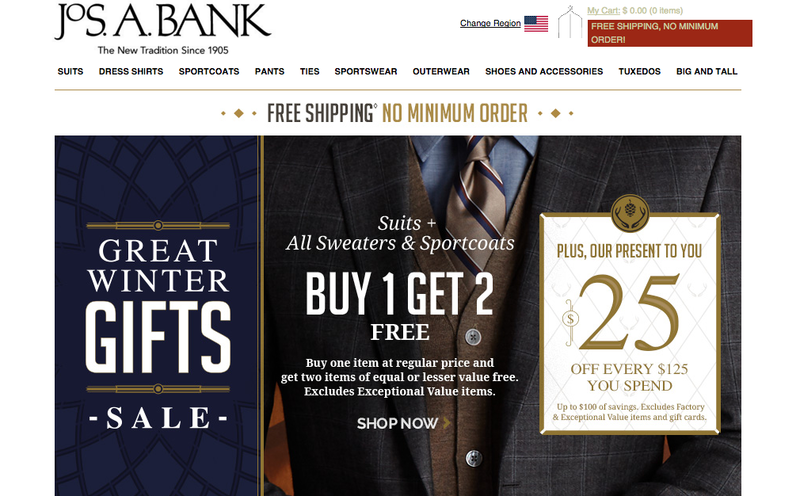 Bank reporting in November that comparable-store sales dropped 14.6% at Bank stores, while the same figure increased slightly at parent brand Men’s Wearhouse. At that time, it was expected that sales would fall 20%-25% in the next quarter. As it stands now, five weeks into the current quarter, same-store sales at Jos. A. Bank are down 35%. That’s in comparison to an average growth of 5% at Men’s Wearhouse and its other brands. “What we did not know then but do now was just how toxic some of the promotions were, and how deep and far-reaching the transformation required would be, and how significantly near-term performance would suffer as we began to execute painful but necessary steps to restore the long-term sustainable profit model and reshape the business towards a healthy and growing Jos. A. Bank,” Ewert said. “During the second quarters and third quarters this year, the effectiveness of the promotional model deteriorated more quickly than we’d anticipated,” Ewert said. The next step is to analyze company data and take customer feedback into account to figure out what promotional strategy will yield the most profitable results. Also included in the turnaround plan: tweaking merchandise, refreshing its marketing strategy and of course, looking at cost-cutting opportunities. Taking all that into account, Ewert said the company is “not anywhere near” a decision to close Jos. A. Bank stores or sell the company.